If you’ve run into her on campus, you might not have made the connection. Lynda Worthy shies away from the spotlight, but she’s the force behind one of the best things about working at Mary Washington: the paycheck. As payroll manager, Worthy’s world is a swirl of deadlines and details, pay scales and percentages. 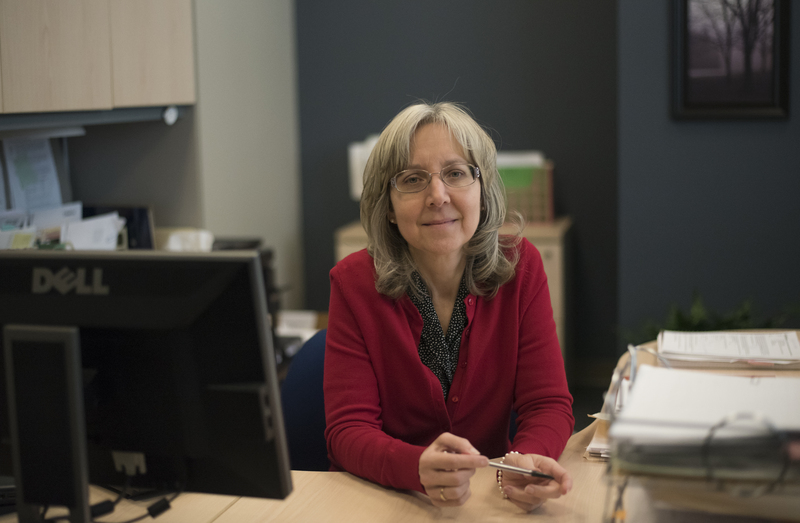 She and her team are constantly hunkered down, crunching numbers – and not just when the fiscal year wraps up in summer, but on snow days and holidays when others are off. She came to UMW 16 years ago to work in Student Accounts, helping undergrads navigate tuition and other financial challenges, but payroll is clearly her passion. In her corner office at Eagle Landing, surrounded by file folders piled high and potted plants that stretch for the sun, Worthy revealed the method behind her magic with money. Q: What’s it like to be payroll manager at UMW? A: Challenging. There are multiple deadlines each week, sometimes multiple deadlines per day! Q: What does your job entail and what are the perks? A: The job requires astute attention to seemingly benign details that have a significant impact on accuracy. Perks? I like working as a team. The payroll staff is very dedicated; they worked during winter break to meet deadlines. Teamwork is essential; each person has knowledge and strengths on which others depend. Q: Do you find it fun to balance your checkbook? A: Fun? No. I do balance my checkbook, but after looking at numbers and computer screens all day, the last thing I want to do when I go home is be on the computer. You get weary of it. Q: Do you have a motto you live by? Q: What do you like most about the university? A: Big question. I like that it’s a place of learning and that it supports lifelong learning for its employees. Things aren’t stagnant here; they keep changing and progressing. Q: What do you love most about campus? A: Campus Walk, with the fountain and the old trees. You get to see all the students, and it helps remind me of why I’m here.